Winona Ryder was born on October 29, 1971 in Winona, Minnesota. She was named after the town where her family lived. A year after she was born, they moved to Petaluma, California, where her family still resides. Winona is my favorite actress and I love every movie that she has been in. I think she is beautiful and has an air of elegance about her. 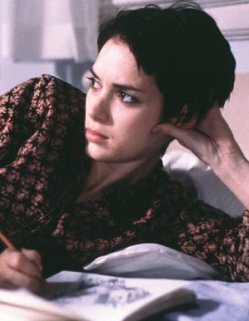 If I could look like anyone in the world, I would choose to look like Winona! Winona and I share the same favorite book, The Catcher In The Rye, by J. D. Salinger. She estimates that she has read it 50 times! I first read it in High School, and I fell in love with it right then. It's still my favorite book to this day. Winona Ryder has been nominated twice for an Oscar. The first time was for Best Supporting Actress in Age of Innocence and the second time was for Best Actress in Little Women. I really feel that she should have won the Best Actress Award for Little Women because she did a brilliant job acting in that movie. In fact, I think that the movie is better than the book! But hey, that's just my opinion, right? There have been Winona Ryder fans to visit since 6/30/97! Disclaimer: This site is in no way associated with Winona Ryder herself and no copyright infringements were intended. If someone deserves credit for any of the images found on any of these pages, please email me.